The apex of the use of Australasia as a place name stemmed from its acceptance as a scientific term to describe a unique ecoregion. This emphasis on ecological uniqueness was, along with theories about racial difference, a central concern of Europeans in their attempts to distinguish and classify world regions. Early evidence of a distinction between Asia and lands to the south was noted by Antonio Pigafetta, who identified biological contrasts between the Philippines islands to the west during the voyage of Ferdinand Magellan in 1521. Much later, more formal ecological boundaries of ‘Australasia’ were mapped, as writers and explorers sought to describe the unique flora and fauna in the region, differentiated from that of Asia. Most significant was Alfred Russel Wallace, who, in the 1860s, observed key differences in bird distributions between the islands of Bali and Lombok in the Indonesian archipelago. Birds observed on Bali were clearly related to those observed on islands to the west (such as Java and Sumatra), while those on Lombok were related to species observed in New Guinea and Australia. Wallace charted a dividing line between these islands and, in doing so, buttressed European imaginations of Australasia as distinct from Asia. 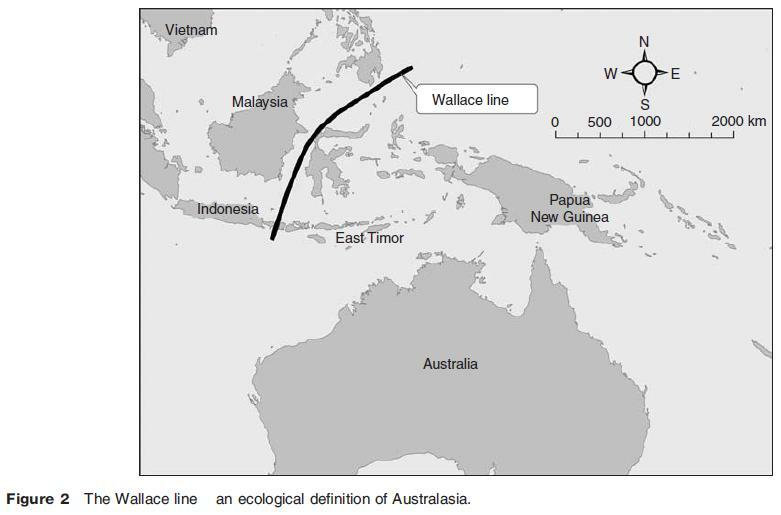 Now known as the ‘Wallace line’ in his honor (and subsequently augmented and re drawn by other biogeographers observing transitions in distributions of flora and fauna among those islands), this cartographic device established the basis of a supposedly fundamental division in world regions that survives into contemporary scientific discourse (Figure 2). The Australasian ecoregion is thus now considered distinct, with its own common evolutionary history and ancestry. It includes Australia, New Guinea/West Papua, Timor, the Indonesian islands of Sulawesi, Lombok, Sumbawa, Sumba and Flores, Vanuatu, the Solomon Islands, and New Caledonia. New Zealand and its surrounding islands are considered a distinct subregion, while the rest of Indonesia is part of the Indomalayan ecoregion. Australasia has since been continuously used as a regional category in botany and taxonomy – hence, the currency of the name in recent scholarly articles, such as ‘Two newly described polypores from Australasia and southern South America’ and ‘A new family of Muscoid Diptera from Australasia, with sixteen new species in four new genera’. It has become a largely uncontested term in science linked to a commonly accepted understanding of a unique world region.